This curved lectern is a 47-inch-tall fixture for giving presentations and speeches. The aluminum and steel podium has a unique design that adds style to any environment. This curved lectern has a large, 25-inch reading surface for keeping notes organized. The 1.125-inch-deep lip is big enough to even accommodate a book. The floor-standing podium also includes a shelf for storing a beverage or presentational supplies nearby during a speech. 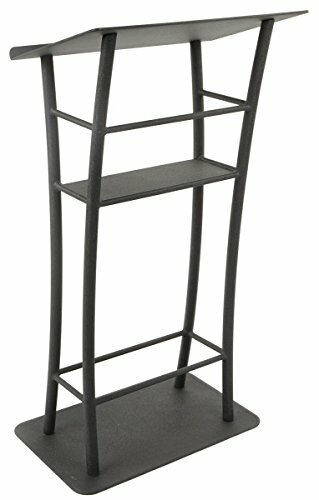 This black lectern with curved post is ideally meant for use in professional settings, such as in lecture halls or convention centers. The aluminum and steel construction provide a sturdy yet still lightweight design that is perfect for frequent use, such as in a commercial setting. 25-inch-wide reading surface offers enough space to hold notecards during a presentation. Curved posts add modern styling to any setting. Built-in shelf keeps handouts or presentation tools easily accessible. 1.125-inch-deep lip keeps notes in place. 47-inch-tall lectern won"t overwhelm most speakers.